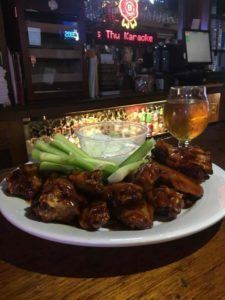 If you’re looking for chicken wings in Doylestown, Finney’s Pub is the place to go! We have more than 35 styles of wings! 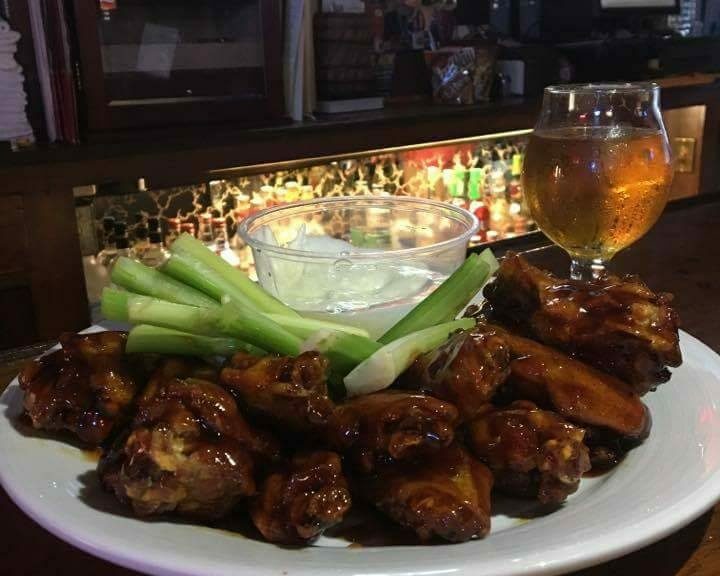 We’ll stack our wings up against any in Doylestown. 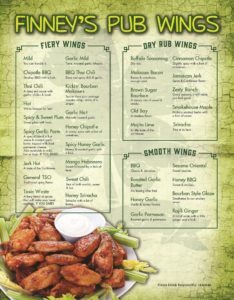 We have the best choices, the widest choices, and the best damn wings in Doylestown! Stop by and check them out — or place your takeout order for the big game. You will not be disappointed! Our Wings are fresh never frozen and cooked to order, every time. How you like ’em is how we make ’em. Check out our flavors, pricing below. Mild: You can handle it! Chipotle BBQ: Smokey BBQ with a kick! Hot: We’re famous for ’em! Spicy & Sweet Plum: Sweet plum with a smooth heat. Spicy Garlic Parm: A special blend of hot sauce & roasted garlic butter, topped with fresh parmesan cheese. Also available in mild, hot or toxic. IF YOU DARE! Jerk Hot: A taste of the Caribbean. General Tso: Traditional spicy oriental flavor. Toxic Waste: A fiery blend of spices that will make your head explode. IF YOU DARE! Garlic Mild: Our classic mild with roasted garlic. BBQ Thai Chili: Our Thai chili cut by a smooth BBQ. Kickin’ Bourbon Molasses: A sweet and savory molasses with a kick at the end; the heat may surprise you! Garlic Hot: Our classic Hot with roasted garlic. Honey Chipotle: Sweet honey infused with spicy chipotle peppers. Spicy Honey Garlic: Honey and roasted garlic with a touch of heat. Mango Habanero: Best of both worlds, sweet and hot. Currently our hottest sauce. Sweet Chili: A hint of spice at first then it kicks in. Honey Sriracha: A honey sauce with a touch of deep Sriracha goodness. Buffalo Seasoning: A sweet and mild version of our classic hot in a dry rub, what’s not to love?! Molasses Bacon: Bacon makes everything better. Brown Sugar Bourbon: Sweet whiskey flavor. Old Bay: A new use for a timeless flavor. Mojito Lime: Crisp and refreshing, one of our favorites! Cinnamon Chipotle: Two great flavors are better than one. Jamaican Jerk: A touch of spice and Caribbean flavor. Zesty Ranch: Good seasons, it will make you feel good. Smokehouse Maple: Smokey with a classic maple flavor. Sriracha: Hot at its best. Currently our hottest dry rub. Roasted Garlic Butter: No kissing after these! Honey Garlic: Garlic and honey blend. Garlic Parmesan: Roasted garlic and parmesan. Sesame Oriental: Sweet sesame flavor. Honey BBQ: Sweet and smokey. Bourbon Style Glaze: Smothered in our smokey sauce. Rajili Ginger: A bit of Asian with a little ginger and a kick. Looking to host a party?